A fun and festive Xmas hamper featuring bubbles, Swedish fruit cider, gingerbread, chocolates, biscotti and fresh fruit. 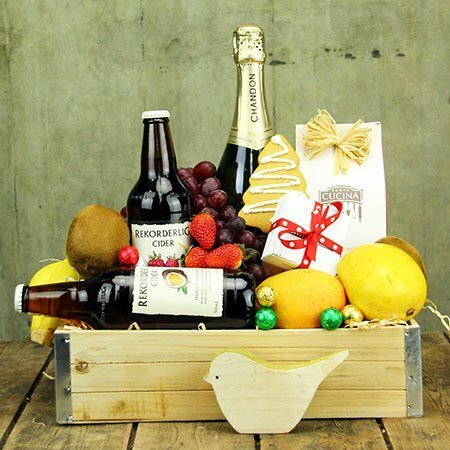 Beautifully presented in a timber crate and decorated with festive ribbon and a carved wooden bird, this hamper for Xmas is focused on quality. The gingerbread is made in the Blue Mountains using all natural ingredients. The gift box of four filled chocolates comes from a boutique chocolate maker in Victoria`s Yarra Valley. Combined with cranberry & pistachio biscotti, a selection of seasonal fruit, Chandon and Rekorderlig cider, you can`t go wrong! Order your Xmas hamnpers now for delivery in the Sydney metro or give our Flowers Elves a call on 1800 66 66 46. PLEASE NOTE: Xmas hampers delivered Sydney metro only. Hampers available from 20th November.